The UN Sustainable Development Goals focus on gender. Here is a slide from a poster session Lynn Wilson and I shared at the Walden National Faculty Meeting in July, 2017. 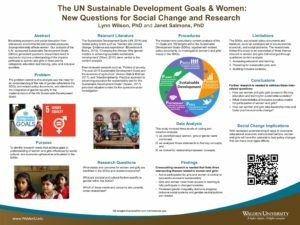 Beyond the obvious- how does progress on UN Sustainability Goals relate to progress for women? In a recent webinar, Lynn Wilson, Executive Director of SeaTrust Institute and I shared our experiences and insights from the UN Climate Summits and research on women entrepreneurs and leaders. The United Nations Sustainable Development Goals include 169 targets, of which at least 30 relate directly to the lives of women and girls in a changing environment. We held a webinar Tuesday, May 10, 2016 at 17:00:00 to look at the critical targets and discuss ways to use corporate social responsibility (CSR) projects, research, and partnerships to create a better future for women and girls. 3. Sustainable jobs and entrepreneurship. For each theme,we examined relevant goals and targets, highlight successful examples, and discuss work to be done. More about women and SDGs here: http://www.unwomen.org/en/news/in-focus/women-and-the-sdgs. Find out more about the programs Lynn discussed at: www.Seatrustinstitute.org. SeaTrust Institute and Vision2Lead are pleased to announce an innovative new public-private partnership! Together, we aim to translate United Nations Sustainable Development Goals (SDGs) into corporate social responsibility (CSR) activities focused on women helping women. This partnership leverages the power of two women-directed organizations, SeaTrust Institute, and Vision2Lead, to engage CSR leaders with training and projects that uplift global women in sustainability endeavors. As part of impacting critical environmental and social changes, women are helping women to address issues that are central to a better future for everyone. Join us for our free International Women’s Day webinar, Women Help Women: Let’s Work Together to Hit SDG Targets! The United Nations Sustainability Development Goals include 169 targets, of which at least 30 relate directly to the lives of women and girls in a changing environment. Join us Tuesday, March 8, 2016 at 17:00:00 to look at the critical targets and discuss ways to use corporate social responsibility (CSR) projects, research, and partnerships to create a better future for women and girls. Email us at: event_registration@seatrustinstitute.org for more information. Log into Eventbrite to register for this free global event and receive your log in link. Educational, employment, and health care needs of girls and women must be addressed in order to achieve the SDGs. As a member of the United Nations Global Compact, SeaTrust Institute is adding this partnership to its research, educational and climate change adaptation projects as part of our commitments for 2016. SeaTrust Institute, led by CEO and founder Dr. Lynn Wilson, is a research and educational NGO that is focused on climate change and the environment. Vision2Lead, led by president and founder Dr. Janet Salmons, is a private consulting firm focused on leadership and social responsibility in the information age. Both leaders have experience in higher education, business, and non-profit/NGO settings. Together, they provide research, educational opportunities and consultations to small and medium-sized businesses, educational institutions, governmental and non-governmental agencies. Contact us at seatrust@seatrustinstitute.org for more information.